Even though its compact size enables it to be carried from room to room, the EB-S41 projector is capable of highly visible images thanks to its high brightness (up to 3,300lm) and superior 15,000:1 contrast ratio. Room lights don't have to be dimmed to see bright and clearly projected images, allowing meeting participants to concentrate better for improved productivity. 3 x Brighter Colours and Reliable Performance* – 3LCD, 3-Chip Technology. Look for both high colour brightness and high white brightness. Amazing Colour Brightness – 3,600 lumens colour and 3,600 lumens white brightness. Crisp, Clear Resolution – Featuring SVGA resolution for sharp images. Travel Friendly – Weighs only 2.5kg and comes with a carry case for convenient travel between home and business. Versatile connectivity – Compatible with the latest laptops and media players and supports HDMI. Epson iProjection – Wirelessly display and control from your iPhone®, iPad® or iPod Touch®, Android™, and Chromebook devices (wireless LAN needs to purchased separately). Easy Maintenance – Both lamp and filter cycle for 6,000/10,000hrs (normal/ECO). 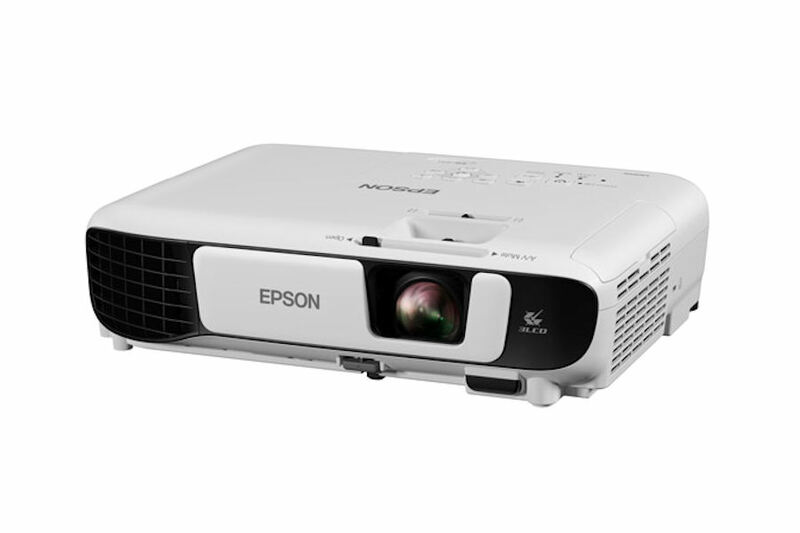 Brilliant high definition image up to 350"
Featuring native resolution up to SVGA (800x600), the Epson EB-S41 projector delivers high quality images and crisp, sharp text without any distortion. Display and control content from your iPhone®, iPad® or iPod touch®, Android™ and Chrome devices with the Epson iProjection App. This free application allows you to travel light and present from your mobile device. Just turn on the projector, use Epson iProjection to scan the on-screen QR code, and share content on the big screen. The optional ELPAP10 Wireless LAN unit is required for the EB-S41. Epson’s advanced 3 in 1 USB connectivity enables instant Plug 'n Play setup for Video, Audio and Control. Forget about complicated computer key sequences and non-intuitive controls. Instead, just plug in a standard USB cable and let your presentation impress the audience. Position your projector almost anywhere in the room and still get a correctly proportioned image with auto vertical correction and horizontal slide image correction. Being able to adjust the image easily and quickly, even in a limited space, makes the EBS41 perfect for narrow spaces, such as on a desk. The short throw ratio means you can project onto a large screen even in small spaces eliminating concern about where presentations can be made. Lamps can blow, if you need your projector working and can't afford down time, you may need to keep a spare lamp. The replacement projector lamp for the Epson EB-S41 is the ELPLP88.